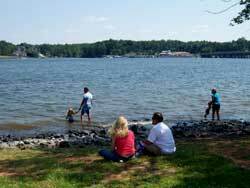 Lake Wylie, SC – Is a rapidly growing lake front town named after the lake. It has a resort atmosphere but doesn’t lose it’s homey feeling because there are dozens of neighborhoods tucked away on the lake in picturesque coves. The outdoor living is very active all around the lake for boating, fishing, and golfing. It is an excellent choice for families and retirees. The South Carolina side borders the lake on the SW and South sides. And further South on the lake is Tega Cay and part of Rock Hill. Charlotte’s only lake front area borders the NE and East sides. Homes by Price Range – Below are price range tables for subdivisions in Lake Wylie, South Carolina, a small community located off Route 485, and 15 miles southwest of Charlotte. Travel west on Interstate 485 and exit south at Exit #1 (Route #49) then proceed 8 miles southwest to Lake Wylie center. A broader and more advanced area search for homes and real estate in the Lake Norman and Metro Charlotte region can be done here or see our city tables for subdivisions in other area towns in a 50 mile radius of Charlotte.